Many of my Beginning in the Middle students learn and perform the easiest version of this in time for Christmas after 5 - 7 months of lessons. The next year they learn the longer version, doubling the length of their solo piece of repertoire. 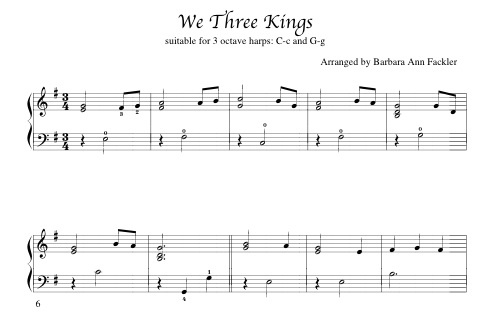 This is a set of three different versions, very beginning (one page) with only single notes and thirds, right hand and left hand playing the same thing an octave apart, a skill building version and an intermediate version. The beginning intermediate version (offered in two layouts: three pages or two pages) uses thirds and three note chords in the RH, mostly single notes in the LH. There are optional LH harmonics and broken three note chords in the accompaniment based upon common shapes to harpists. The intermediate version includes a setting for 22 string harps that does not go below the C at the bottom of the bass clef staff. By request, this is now available in three keys: key of e minor (one sharp), key of a minor (all natural) and key of c minor (3 flats). suitable for 22 string harps C-c or G-g. 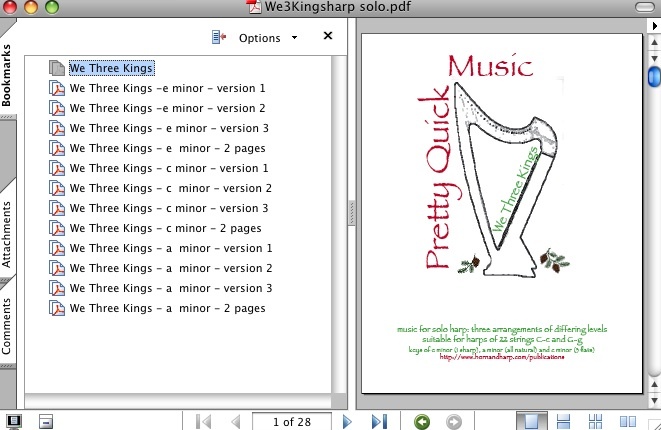 The harp ensemble version is based on this solo version.